I remember, many moon ago, the first time I listened to "Heroes". I felt it was weird and discordant, Black Out freaked me out a bit. Now it isn't... why? Because I have head so many weird things in between that this is just interesting. 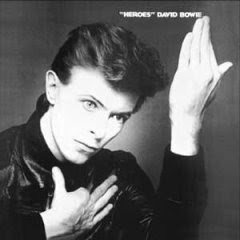 "Heroes" is indeed an interesting album, I think of it as the other side of the coin that is Low. While Low has a pretty downbeat sound this is the high. It is a particularly "high" album on the first half, it follows Low's blueprint in having a second side mainly devoted to instrumentals. The album itself is also propelled higher because of the use of Fripp's guitar which stands out throughout the album. In the end this isn't as good as Low but it is not far off, it is an essential companion to Low. Eno makes himself known throughout, if you take the lyrics from the title track it could absolutely be a Eno piece, and a good one at that. This is the last David Bowie album on the list, and for good reason, he would never return to this level of quality, not even in Lodger, his last Berlin album. So a long farewell to Bowie... although he will be producing some good albums late in the list. He will be missed. Recorded at Hansa Studios in what was then West Berlin, "Heroes" reflected the zeitgeist of the Cold War, symbolised by the divided city. Co-producer Tony Visconti considered it "one of my last great adventures in making albums. The studio was about 500 yards from the wall. Red Guards would look into our control-room window with powerful binoculars." Bowie again paid tribute to his Krautrock influences: the title is a nod to the track "Hero" on the album NEU! '75 by the German band Neu!, while "V-2 Schneider" is inspired by and named after Kraftwerk's Florian Schneider. This came about because earlier in 1977, Kraftwerk had name-checked Bowie on the title track of Trans-Europe Express. The cover photo was inspired by Erich Heckel's Roquairol, as was that of The Idiot, one of Bowie's collaborations with Iggy Pop that was released the same year. I actually like Outside, but it has been universally slated by critics. And yeah Heathen and Reality could be combined into a really good album. And there's no Scary Monsters, no Lodger...and thankfully no Tin Machine!